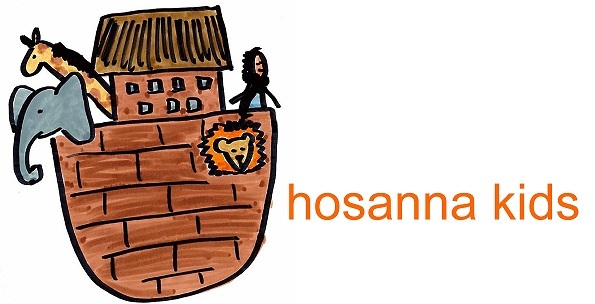 This lesson aims to teach children that the Bible is very special because it is God's word written down for us. Children have the opportunity to learn and think about how people over thousands of years have been careful to keep God's word safe, so that we can read it today. 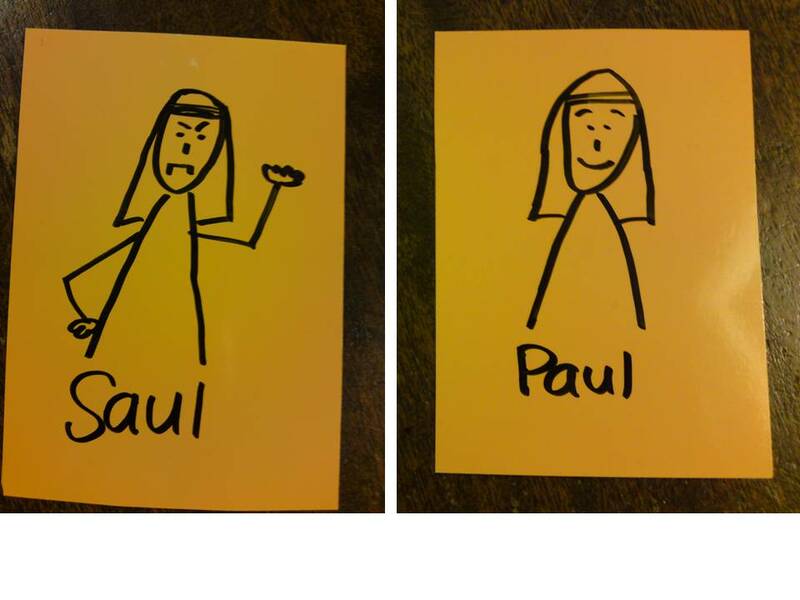 Opening Activity: Tell children to find a special important message hidden somewhere for them in the room. Open the envelope to find a memory verse puzzle. This is a great game that can go with the many of the fishing stories in the Bible. I used it for the story about Jesus appearing to Peter and the disciples after his resurrection, while they were fishing. 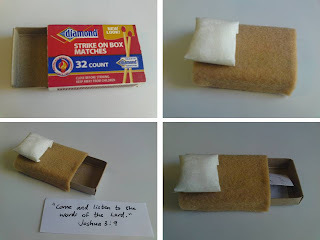 For activity ideas and how to make a matchbox bed, see below. This lesson was really fun for me! Intro Question: What are some things that people have made for you? We started the lesson talking about things that other people have made for us. I told the kids about the beautiful bedspread and matching curtains that my Mum made for me once. We talked about how making something for someone can show that you love them. Today we're going to learn about the things that God made that show us he loves us. 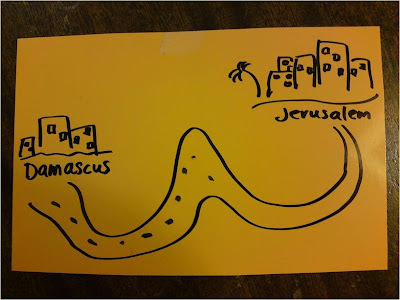 I showed the place in the Bible where the story comes from. One of the kids wanted to read it aloud so I had him read the first verse (Genesis 1:1). We talked about God making day and night, and trees and plants, animals, birds and sea creatures, and how these were all good things that God made for Adam to enjoy. God gave Adam jobs to do - to take care of the garden (we talked about what that might look like), and to name all the animals. God then made Eve, a companion for Adam. Pastoral note: After telling the story, even though they're just six, I thought it was important to talk about why the kids might not hear this story at school. I told the kids that they will meet people who don't believe the same as what they believe, and that they won't always believe what other people believe. But that they can know what they believe, and even why we believe it. Using an old box, we made our very own garden of Eden. I gave the kids a variety of materials to choose from - playdoh, construction paper, felt. They were so excited to make things for the garden, they wanted to make sure we could keep it in the classroom for them to see next time. 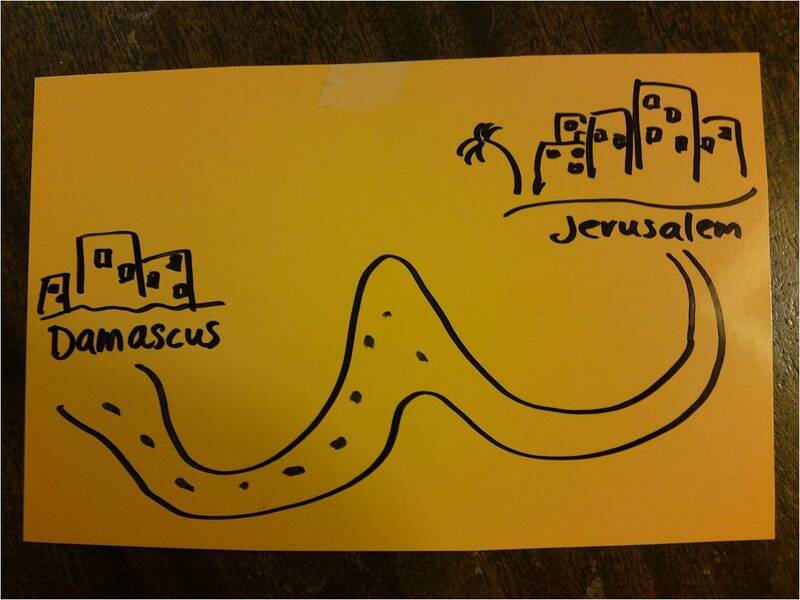 Our story this morning was about David bringing the ark of the covenant back to Jerusalem (2 Samuel 6). I had the boys carry the "ark" in a relay for our active game, a shoe box on some pool noodles. They loved it!